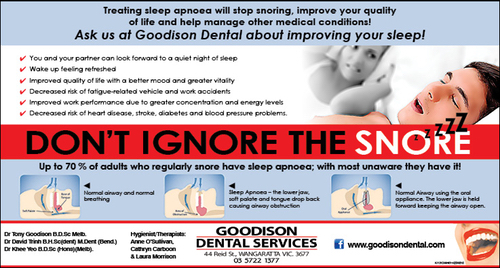 2 out of every 10 Australian adults snore, and while for many it causes no significant medical problems – for some, it may indicate a more serious condition called Obstructive Sleep Apnoea. This can lead to heart disease, an increase in blood pressure or a life-threatening event such as stroke or heart attack. All people that snore should be tested for obstructive sleep apnoea. Obstructive Sleep Apnoea is caused when the soft tissues at the back of the throat relax too much, or collapse, during sleep and obstruct the airways. These interruptions to breathing may occur many times a night with each episode lasting from 10 seconds up to two minutes. Usually the sleeper has no awareness of these episodes but may find that sleep is not refreshing. Our dentists are trained in oral appliance therapy and can treat obstructive sleep apnoea and troublesome snoring in cooperation with a respiratory or sleep disorder physician. Lifting up the soft palate. Holding the tongue forward, or a combination of these three methods. Our dentists can determine the correct appliance to suit your specific medical condition. The treatment of snoring or obstructive sleep apnoea with an oral appliance is safe, painless and effective and does not require surgery. They are relatively easy to wear, and it is possible to speak, yawn and drink while wearing your oral appliance. Contact our team today if you are suffering from snoring or sleep apnoea. We look forward to helping you learn more about these devices so you can enjoy safe, quality sleep and wake up feeling refreshed again.